"RAAS Devigarh is a testament to the beauty and charm of old-world Rajputana. The 18th century palace holds a commanding position over the Aravali hills. It overlooks the village of Delwara that marks one of the three main entrances into the valley of Udaipur. In 1999, the marvelous palace was restored to its former glory and converted into an all-suite luxury hotel. It's a fascinating combination of the ancient and ornate architecture merged with modern minimalist designs all equipped with state of the art facilities. Guests are treated to unrivalled experiences of myriad comforts. Nestled in the Aravali hills of Rajasthan, the 18th century Devi Garh Fort Palace This palace was awarded to Rajrana Sajja Singh and his brother Ajja Singh, for his bravery and loyalty to Maharana Pratap at the battle of Haldighati (1576) against the Mughal emperor Akbar. After the Rajputana provinces came under the Republic of India, the palace fortress fell into ruin. After a significant restoration for 15 years, the palace was reopened as one of the luxury heritage hotels in 1999. The all-suite at RAAS Devigarh Resort offers luxury at its best. Recreating the old-world charm, accommodations at the resort are royal, luxurious and truly princely. Feel like royalty while staying at these luxurious lodgings. The Garden Suites at Devigarh combine the royal pleasures with bliss of nature. Overlooking the palace's most beautiful garden, the suite offers guests the best view, host of amenities at their fingertips as well as the privacy of their private tented-terrace. 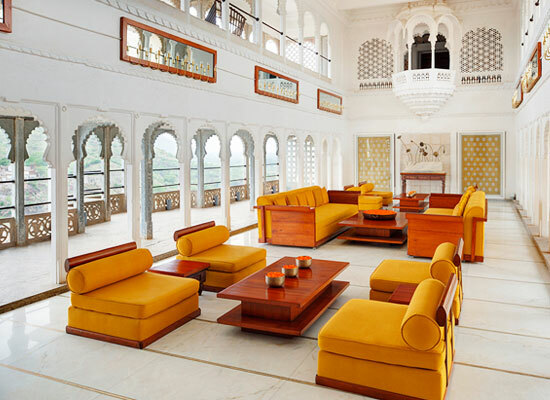 True to Devigarh's aristocratic roots, the Palace Suites offer true luxury. Each suite has its own unique design. Each room has marble interiors adorned by combinations of semi-precious stones, luxury facilities, regal feel and an experience to cherish. 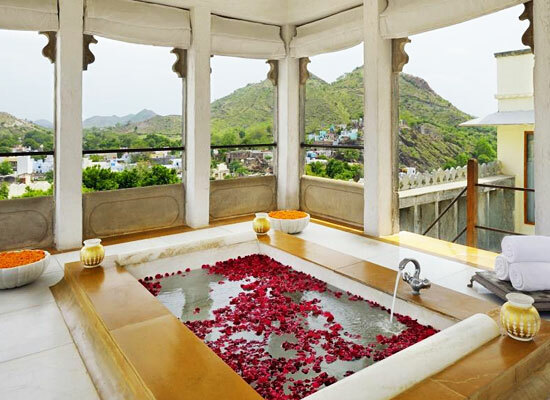 The Aravalli Suite at Devigarh offers guests a stay in the old stately and authentic Rajput palace. Boasting of complete privacy and spaciousness, their designs incorporate ornate and traditional motifs that are carved beautifully. 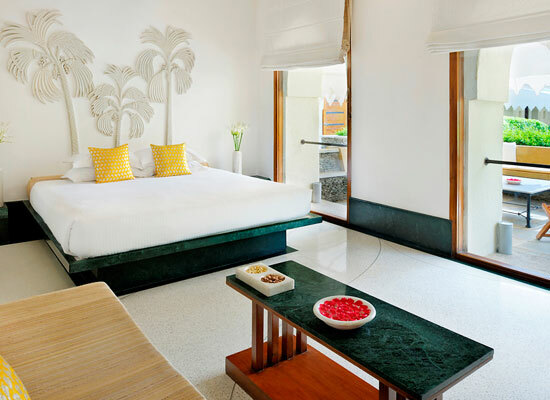 The Devigarh Suite caters to your every need, and does so in royal style. The golden bedroom extends onto a private sundeck and jacuzzi where guests can revel in the perfection of our most esteemed suite. Dining is as amazing as the other aspects of Devigarh Resort. The menu ranges from local to international, Asian to continental, health conscious spa menu to some mouthwatering specials at the restaurant. The bar serves an interesting assortment of medicinal herbal teas, liquor and cocktails. 24 hours room service, party services and other specialized services are available on request. Open 24 hours, the Bar is the place to be for a glass of wine on the balcony or a mid-morning chai masala in the lounge, fresh coffee, hand-squeezed juices, and many alcoholic options. Also, the wine list showcases the best of India’s up-and-coming vineyards, as well as a carefully curated selection of international wines. The view from the bar is as intoxicating as the drinks offered. The highlight of the restaurant is its seasonal menu, with ingredients home-grown and picked a from the chef’s garden. Dine as you enjoy superb panoramic views over the surrounding countryside and the Aravalli hill range. 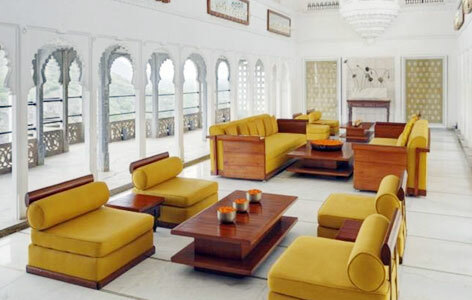 The decor is complemented by original wall paintings of Devigarh’s former rulers and historic photographs of the palace. The Durbar Courtyard offers diners a unique experience in a beautiful ambiance. You can choose a private venue for an intimate lunch or evening drinks in an open-air venue with enviable views and soothing melody of gently cascading water. An intimate setting for meals, Hawa Gokra was originally built with many windows to harness the refreshing energy of the natural breeze and keep it cool in the summer. Decorated with roses and candles, the setting becomes quite romantic and a very special place to share dinner. Janana Courtyard offers the venue to enjoy local delicacies from the world-class kitchen in an open-air setting steeped in the history of Devigarh palace. The former women’s quarters of the palace welcome diners to an inviting setting. Ideal for a family or couple to enjoy a tailor-made meal, the Lounge Balcony offers clear views of Delwara village. Decorated with fresh flowers, candles, marble pillars, mirrored ceiling, it is home for fine dining, good friends and good cheer. The garden lawn, a contemporary garden in the heart of Devigarh Palace, Phool Bagh is an unforgettable setting for meals. Wreathed in sparkling lights, the gardens resemble glittering landscape that mirrors the starry sky. For the best meal in Devigarh, with the backdrop of the setting sun arrive at the Pool Deck. 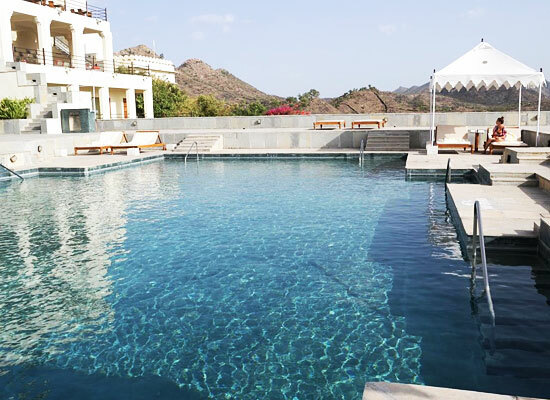 Blessed with spectacular view of the Aravalli Range, this open-air terrace pool is the ideal venue for breakfast, evening drinks, high-tea or dinner. The walled veranda with a private Jharokha, is the venue to dine in royal style with mouthwatering delights under the stars, or sheltered from the sun under a canopy with cooling breezes. The view over Delwara village and the lush region of Aravalis in Rajasthan is a memorable venue for lunch, dinner, or just to raise a glass to the good life. The Sheesh Mahal like its name explains is a room of the hand-decorated mirrors in the courtyard of the palace. Here in this intimate setting Devigarh's former kings have entertained their queens and royal guests. Now, its time to relive the moments. Like its name the Silver Lounge has silver furniture, and walls that mirror the luxury of the room. 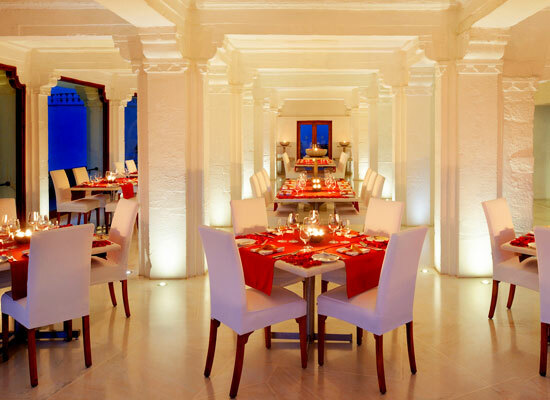 It offers diners an opulence that make it one among the most desirable places to eat around Udaipur. The food matches the delightful setting. Rajsamand District is famous for its artificial royal lake. An elegant stepped embankment with several decorative arches and pavilions by the lake called was Nauchowki("Nine Pavilions") built by Raj Singh and reveals exceptional architectural prowess.